This dynamic duo have done it again! 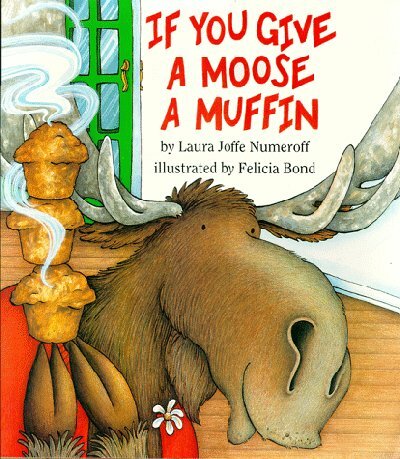 They follow up their hit children's book, "If You Give A Mouse A Cookie" with the hilarious antics of a moose in "If You Give A Moose A Muffin". This mannerly moose smells something good. He is invited in for a muffin. But when he eats all of them, this massive moose wants you to make more! And since you are out of ingredients he wants to go shopping with you. It's cold outside and he wants a sweater which leads to a puppet show and a huge mess. In the process of cleaning up he spies berries and is reminded of muffins once again. The clever renditions of a moose, whose size is an integral part of the humor in this tale, are spectacular! Nothing could be funnier than seeing a gigantic moose having a puppet show. I recommend this story for preschool age children, 3-5 years old. With their belief in animals being able to perform like people, they will love the mischievous behavior of this massive muffin-loving moose.